The Old Spanish National Historic Trail stretches between Santa Fe and Los Angeles, embodying a rich history, culture, and scenic beauty. In the early 1800s, this trail served as the key to Santa Fe’s success as a trading hub. Since then, it’s become a popular spot for people to explore and walk through history. 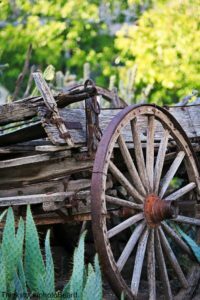 There are many reasons why you should explore the Old Spanish National Historic Trail during your stay in Santa Fe, but here are a few of our favorites! Do you want to know other hiking spots like the Old Spanish National Historic Trail? Download a copy of our free vacation guide to see all the best things to see and do during your Sante Fe vacation! We know that planning a trip can be challenging and time-consuming, so we created this free guide to save you from hours of research. Get your copy today! The trail extends 2,700 miles across New Mexico Colorado, Arizona, Utah, Nevada, and California. Throughout the distance of the trail, you’ll find museums, historic sites, landmarks, and more. Whether you’re making a short day trip along the Old Spanish National Historic Trail or planning a journey through several states, there are resources available for trip planning. You’ll be able to prepare everything in advance! The Old Spanish National Historic Trail was once known as the Old Spanish Trail. It started out as a series of indigenous footpaths used for early trade and exploration routes. In 1829, the first commercial caravan was led by Mexican trader Antonio Armijo from Abiquiu, New Mexico, to Los Angeles, California. Along these man-made routes, Mexican and American traders traveled and exchanged goods with Native American tribes along the way. The trail became known as a mule pack route and was also used by trappers, prospectors, and immigrants. Travelers braved the dangerous terrain, crossing beautiful but dangerous rivers and miles of desert. In 1847, the Mormons initiated wagon travel along the trail. From all this trade networking and transportation, two main routes emerged: The Armijo (Southern) Route and Northern Route. However, once the United States took over the Southwest in 1848, many other passages to California surfaced, so the use of the Old Spanish Trail declined. There are several paths to choose from when embarking on the Old Spanish National Historic Trail. The main stretch begins in Santa Fe, conveniently close to Four Kachinas. This route loops northward toward central Utah, then down to the artesian springs in Las Vegas. Beginning at the Santa Fe Plaza, you can follow a stint of this extensive trail up the Rio Grande Valley toward Northern New Mexico and the Continental Divide. You’ll love exploring the Old Spanish National Historic Trail, but eventually, you’re going to want to put your feet up! After experiencing some gorgeous desert views, come back to Four Kachinas for some rest and relaxation. Each of our cozy rooms offers outstanding amenities for your convenience. Plus, you get to wake up to a delicious breakfast to start your day off right and get you ready for your next adventure! 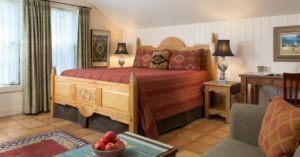 The fun never ends in Santa Fe, so be sure and stay at Four Kachinas for easy access to all of it!